Have an interest in Veterinary Nursing? 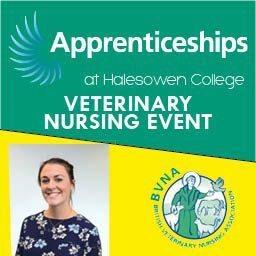 Attend our Careers event, and hear a presentation by Jo Oakden from the British Veterinary Nursing Association on ‘A Day in the Life of a Veterinary Nurse’. There will also be a presentation on Apprenticeships, followed by a Q & A session, before you will have the chance to speak to lecturers for advice about the courses offered at Halesowen College.